We’d love your help. Let us know what’s wrong with this preview of In Dreams by Erica Orloff. To ask other readers questions about In Dreams, please sign up. Digno de un drama del Olimpo. es una historia se puede decir un poco conocida, sin embargo tiene su toque, ella hija del dios de los sueños, nuestro muy adorado Morpheo, y una humana estudiosa. El un dios minotario que no le importa dejar todo por ella. ella me parece un poco sosa al comienzo, eso del drama principal de soy una semidiosa bla bla bla... sin embargo no encuentra su verdadero poder sino hasta muy muy avanzada la historia, en cual existe el típico drama familiar de la familia mas dis Digno de un drama del Olimpo. ella me parece un poco sosa al comienzo, eso del drama principal de soy una semidiosa bla bla bla... sin embargo no encuentra su verdadero poder sino hasta muy muy avanzada la historia, en cual existe el típico drama familiar de la familia mas disfuncional de toda la historia. el hermano que quiere el reino del hermano, la hija que no debe existir, los tíos buenos y los tíos malos. sin embargo esta historia no gira entorno los tres grandes hermanos en guerra, sino a uno que muy pocos conocemos. Me gusto la participación de Nyx, como madre de morpheo y epiales, su aura y como llega a aclarar las cosas. Iris's dreams are always the same- a long hallway filled with doors, her holding a set of keys, and a disembodied voice telling her to find him. In her waking life, she lives with her grandpa and her mother, who has Sleeping Beauty syndrome. She doesn't know it yet, but her father is Morpheus (yeah, like from Splintered :D), Greek god of dreams. Iris will do anything to find the literal "man of her dreams", even if it means risking her life, as well as the lives of her friends and family. ..........So yeah. The plot was kinda a shocker. The book summary didn't give away much. Not-as-famous Greek gods and goddesses are the ones featured (Morpheus of Dreams, Epiales of Nightmares, Nyx of Night), rather then the dreadfully rehashed and repetitious gods such as Zeus, Hades, Poseidon, etc. Aphrodite's character felt like the only one that was carefully developed. She's plus-sized instead of skinny, because being the goddess of love means that you love yourself enough to pamper yourself. Iris was three-forths of a Mary Sue. Her biggest defense against much of anything was to scream, run, scream, hide, and then scream again. In that order. I would have preferred that she had some powers and been a BA. And, of course, she's perty, shmart, and speshul with a best friend attached. Annie. Hmmm. Everything that made Annie Annie wasn't mentioned that often. Actually, she would've made a better main character. Sebastian doesn't deserve a paragraph. Morpheus, Iris's mom and grandpa were pretty run-of-the-mill. The grandpa was awesome; lifting weights, hitting people with baseball bats and being there for anyone all at the ripe age of 77. The Hallway of Doors! Lots of doors needing keys, each one a different dream. Also nicely depicted on the cover (ignoring the look on the girl's face and her outfit). The bad guys- meh. They want power and blood. Whatever. There's a lot of dreams in this. Why? Cause Iris's dreams are where anything happens at. The ending was too perfect. Not the good perfect, but too perfect. Then again, it is a single book with no impending sequel (it's too early to tell that, though). This was an okay novel. I've read two of Orloff's novels and both have been 2 stars... I think I may be seeing a pattern and she may not be an author for me. So this book... Did not see it turning into a mythology book. Not at all. Nothing wrong with it, but based on the blurb? Definite twist for me. And it was a unique twist as well. About dreams, nightmares, etc. It's something different that I haven't read about before, so I was intrigued to know how it ended. But it was a struggle to make it This was an okay novel. I've read two of Orloff's novels and both have been 2 stars... I think I may be seeing a pattern and she may not be an author for me. And it was a unique twist as well. About dreams, nightmares, etc. It's something different that I haven't read about before, so I was intrigued to know how it ended. But it was a struggle to make it through the book. When I got half way, I really wanted to call it quits, but I stuck through it. I wanted to see if the ending completely changed my mind about the book as a whole. It didn't, but that's okay. Now I know what the book is about and the storyline, so I can tell the teens at my library what it is about in case they are interested in it. This book was just okay. The Greek mythology storyline was awesome, and if this had just been about that I would have loved it. However, there was an incredibly dull and creepy "love affair" that took up most of the novel, and that entire plot was awful. I found myself skipping past her dream make out sessions to get back to the good part of the story, and I truly don't understand why this "relationship" was at the forefront of the book. I loved Iris's relationship with her Grandpa, her mother's This book was just okay. The Greek mythology storyline was awesome, and if this had just been about that I would have loved it. I loved Iris's relationship with her Grandpa, her mother's odd sleeping disorder, and her best friend's fierce loyalty. I also adored this depiction of Aphrodite! If this had just not had the Sebastian plot in it, I would be giving it 4 stars. It's really a shame that this forced relationship took such prevalence in the book, because it could have been great. This book really fell flat in mostly every way. The characters were annoying and flat. The blurbs out the book gave me no indication it was about Greek mythology, and it was not a pleasant surprise. The plot was just blah and pointless. The steamy romance I was expecting was non existent. Main Character: Iris— (3.5/5) This girl got some major points from me for her strength and determination. Not even the threat of her complete demise could convince her to give up fighting. Secondary Characters: I’m not even sure what to say about Aphrodite. I thought she seemed suspiciously overbearing and I kept waiting for her to turn out evil, but she didn’t. Annie was probably my favorite secondary character. She had a true understanding of and care for Iris. Pacing: The pacing was good. Accuracy of Publisher’s Synopsis: The synopsis isn’t actually inaccurate, but it narrows the scope of the plot to only one of its many offerings. I would have been more drawn to the book if it was described as its entire premise and not just her dream about a boy. Resolution: The ending was kind of awkward to me. It felt like the whole book was gearing me up for an epic Underworld showdown, but all I got was a fistfight. The Good: I hadn’t known that Greek mythology was going to guide the major plotline. The presence of gods and goddesses definitely added a layer of intrigue. It was a lot less about the boy in Iris’ dreams and a lot more about Iris’ secret family. I was more inclined to read just to see where it went. I liked all of the characters and their interactions. The Not So Good: The book is purportedly all about Iris finding a way to be with Sebastian. The more accurate description would be that Iris struggles to come to grips with her newly revealed identity as a demi-goddess after realizing that her dream world is real and is being wielded as a weapon against Iris by her evil uncle. That’s kind of a significant discrepancy in my book, but it wasn’t unwelcome. However, since a series I love was based on a similar plot, I tried to project my feelings toward that series onto Orloff’s book; it just wasn’t the same kind of book, though, so I was thrown off. With the actual book, though, I only had a couple of moments that tripped me up. One was the moment when Iris’ mother let slip that she willfully abandons her for weeks at a time as she visits Morpheus in her sleep. But when Iris reacted, her mother was quick to say that wasn’t what was happening. Also, I was really hoping to see Iris end up trapped in the Underworld or something, fighting against Epiales, begging Hades for help, and dragging Sebastian through the River of Sorrows. But none of that happened. I was underwhelmed by the direction the book went in, especially with all the potential there was to take it to the next level. Overall Impression: This book was not at all what I expected, but it was a quick, easy read. There was a unique plotline filled with characters that don’t normally get a spotlight in Greek mythology. My only true dissatisfaction was that the book fell short of the expectations I had for it. Would I recommend it? In Dreams is light and quick, a perfect weekend read. 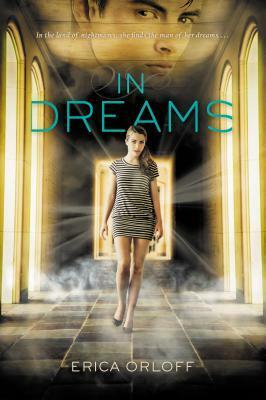 In Dreams is the first book I've read by Erica Orloff and I enjoyed it. I rarely enjoy YA books and this one, I was hooked!! Loved it! Great read. About a man in her dreams that is haunting her and trying to find him in time to save them both. In Dreams is the type of book you buy because you're in a reading slump because it gets you out of it. I loved this book and all the characters were amazing, I didn't hate anyone. It's a stand alone as far as I know but it's very unique. It has Greek mythology but it centers around a few select gods. Morpheus, the god of dreams is Iris's father while her mother is mortal. Her uncle Epiales, the god of nightmares is planning something that is only revealed at the end of the book. Iris has only me In Dreams is the type of book you buy because you're in a reading slump because it gets you out of it. I loved this book and all the characters were amazing, I didn't hate anyone. It's a stand alone as far as I know but it's very unique. It has Greek mythology but it centers around a few select gods. Morpheus, the god of dreams is Iris's father while her mother is mortal. Her uncle Epiales, the god of nightmares is planning something that is only revealed at the end of the book. Iris has only met her father a handful of times and she hadn't even known it at the time. Iris's dream "guardian" Sebastian and her fall in love and he wants to become mortal for her but Iris has to deal with everything else first. This was a refreshing read after my NA binge. At first it was slightly slow and I was ready to give up on this book. But about halfway it got interesting and then had hooked. Iris has been having the same dream for a long time. She's always in this hallway surrounded by doors and a guy's voice. After a few chapters it seems repetitive, and then there is finally a face to the voice. Things start to pick up, her dreams are becoming real, and next thing you know, you're finally hooked. When her drea This was a refreshing read after my NA binge. At first it was slightly slow and I was ready to give up on this book. But about halfway it got interesting and then had hooked. When her dreams start to become real, Isis starts to freak out, but no matter what her best friend believes her about her dreams and about being a half-goddess. Yup turns, out there is a reason for her mom to always be asleep and Isis having these dreams. Her dad ends up being the god of dreams. Really liked the mythological premise of this book. And I LOVED the portrayal of Aphrodite as a curvy, pastry-loving aunt. Ending seemed a little rushed, but the plot moves fast and is filled with neat characters. My main complaint-- and this is not at all the author's fault-- is that the cover is hideous! Iris is described as having long, curly black hair. The cover features a girl with shoulder-length blonde hair. There was so much to work with to create an amazing cover, and the publisher ble Really liked the mythological premise of this book. And I LOVED the portrayal of Aphrodite as a curvy, pastry-loving aunt. Ending seemed a little rushed, but the plot moves fast and is filled with neat characters. My main complaint-- and this is not at all the author's fault-- is that the cover is hideous! Iris is described as having long, curly black hair. The cover features a girl with shoulder-length blonde hair. There was so much to work with to create an amazing cover, and the publisher blew it-- it looks cheesy. In Dreams was an interesting quickie read that I enjoyed. I needed a light summer read and I liked the premise of this book. It was mysterious from the get go and I found the unfolding of the story to happen at a steady pace. It took me in directions I did not expect and I found myself really drawn into the plot. I couldn't put the book down as I wanted to know how everything would play out. Check it out....quickie read but really interesting. 4/5 stars! While a lot of books have been taking Greek myth and doing retellings, Orloff does something different by focusing on the lesser gods that most people forget and creates a different spin on dreams. Not only that, but Aphrodite is so much more than she's often portrayed and she attacks today's notion of Western beauty and encourages Iris and Annie to ignore this notion. Quite probably my favourite character in the book because of how awesome she is! This book was okay but not so great I would read it agin. I think it needed more emotion. Reading it I didn't get the urge that something really good was going to happen. I never felt as though I needed to keep reading. I just don't think it was the book for me. I skimmed through this one quickly. The plot twists were not at all what I imagined after reading the flap of the book. That was a pleasant surprise. Needs a cover redesign - not only is the cover misleading but the girl has black, curly hair and that is mentioned many times throughout the book. I'd give In Dreams a 3.5/5 stars. It was a really good concept and I liked the love story but I'm just not so sure about the execution. In general it was a good read and I really liked the Greek gods aspect! I have read another book by this author-illuminated and I liked it a lot more than this book. I liked the story idea, but it didn't have enough depth to make it believable. It also had a totally out of left field coping a feel make out moment that ruined the romance. TOO SHORT! I NEED MORE!! Agh, de verdad quería que me gustara, pero todo es tan absurdo! I looooooooove greek mythology but arg! this book is so boring,I'm pretty sure that more than half of the story could be ignored. I love Aphrodite, she sure is different than how people usually portray her. She's the coolest aunt yet.